Proline Dredge/Highbanker combos have become the standard against which all other dual purpose machines are measured. We feel the reason is simple. All of our combos are designed with one goal in mind: build a machine that can actually do both of its intended jobs well yet remain lightweight and simple in design. Take a closer look at comparable machines on the market today and you’ll likely find a highbanker which, over the years, was retrofit with a “kit” to make it possible to dredge with. This system, unfortunately, doesn’t address the many tradeoffs encountered when trying to perform two functions with one unit. 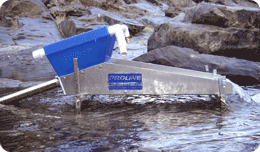 Every Proline combo was designed from the ground up to be both a dredge and a highbanker. As a result, it performs and looks totally different from anything else on the market. 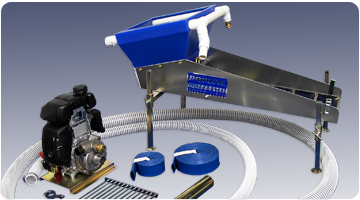 All Proline combos use a highly efficient power jet for producing dredge vacuum rather than the old-fashioned suction nozzle which is inherently less effective and more cumbersome to dredge with. We have developed a unique system in which all dredged material enters the unit under the grizzley rather than above it. This is a much more efficient means of processing dredged material for two reasons. First, depositing this material above the grizzley would require the dredge to lift the gravel much higher above the water level to process it. This would decrease the dredge’s suction power considerably, make it less stable, and increase the rock jams encountered when dredging. Second, more importantly, it is a fact that if the material is deposited on top of the grizzley (such as with other combos) then the grizzley has to be mounted at a very steep angle to allow rocks to slide off on their own in order to prevent the hopper from quickly loading up. If the rocks slide off so will the gold bearing gravel, clay, etc. without being thoroughly washed first. 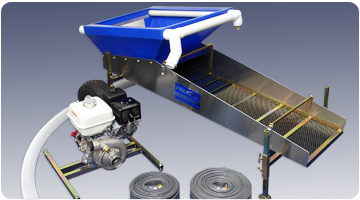 The highbanker portion, often referred to as a “power sluice,” is different as well.The hoppers on our combos are considerably larger and receive a dual spray manifold with the proper size and number of spray holes to closely match the performance of their respective pumps. As previously mentioned, because our dredge runs intact, this allows the grizzley to be mounted at the proper angle for effective high-banking. 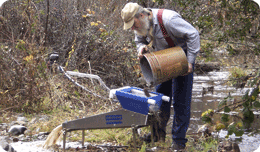 Simply feed bank-run material into the hopper and let the washing action do its job until it has dissolved all of the gold-bearing clays or has completely washed off all the rocks. This is quicker, and certainly more efficient, than shoveling the material through several times in order to process it thoroughly. 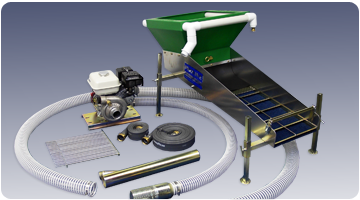 Every Proline combo receives Nomad, also known as Miners Moss, as the standard matting to work with our triple classification and larger sluice boxes for unequalled gold recovery. The construction of these units is different as well. Our unique “delta box” sluice box is extremely strong and mounts the hopper to the unit at the correct location for high-banking and to simplify transport. 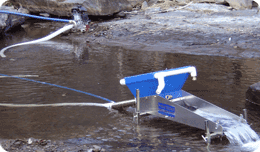 Our stands are solidly bolted to the bottom of the sluice box, adding rigidity to the entire unit, making for a more stable platform when dredging or high-banking. Proline combos feature heli-arc welded construction, zinc plating for corrosion resistance, grade 8 hardware, and top quality hoses, fittings, etc. Please take a look at our comprehensive listing of dual purpose units. Please contact us if you have questions regarding our combos. We’ll take the time necessary to help make your purchase the right one for you. Our Proline Big Banker is a highbanker suitable for feeding with the new breed of mini-excavator available these days. 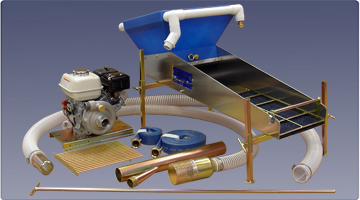 The hopper is 29" x 33 " with a 20" wide x 72" long sluice. Comes complete with Honda GX270 engine and HP500 pump with base plate and hoses. Comes with axle and tires to aid in moving the unit around.